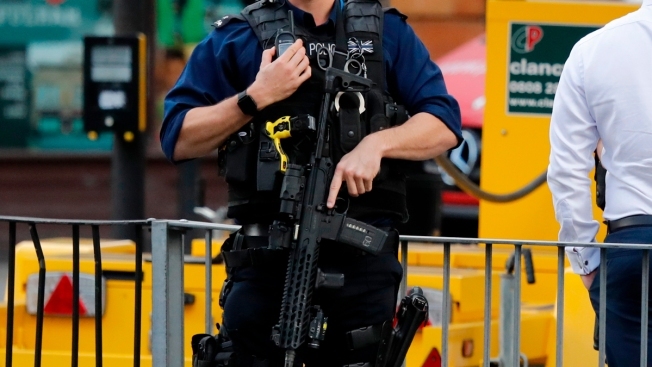 In this Friday, Sept. 15, 2017 file photo, an armed police officer stands nearby after an incident on a tube train in London. British officials say armed and undercover police officers will patrol train stations with routes leading to Windsor when Prince Harry marries Meghan Markle on May 19. British officials say armed and undercover police officers will patrol train stations with routes leading to Windsor when Prince Harry marries Meghan Markle on May 19. British Transport Police said Thursday there will be a visible deployment of officers along with canine units and specialists trained to detect dangerous behavior. Superintendent John Conaghan says transport police are working closely with local authorities and other police forces to ensure they can respond quickly to any incident. There will also be specialist teams ready to deal quickly with reports of unattended items being found in stations or on the railways. Officials expect more than 100,000 people to travel to Windsor to try to see the royal couple. Extra trains will be added.